Visit the Philharmonie concert hall in Berlin on Tuesdays for free lunchtime chamber music concerts by world-class performers. 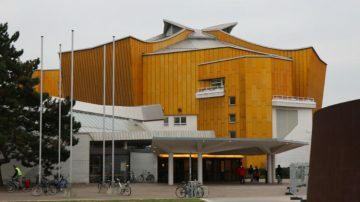 The free Lunchkonzerte der Berliner Philharmoniker on Tuesdays are gratis cultural highlights for visitors to Berlin. Locals and foreign tourists alike may enjoy these free 45-minute lunch concerts in the foyer of the Berliner Philharmonie – one of the most famous concerts halls in the world. Guided tours of the building and concert halls are available daily. 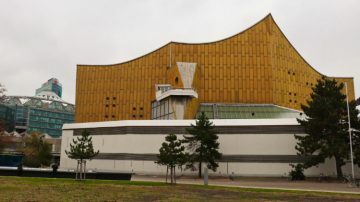 The emblematic Berliner Philharmonie is one of the most revered concert halls in the world and with its golden-yellow exterior cladding instantly recognizable. It is home to the Berlin Philharmonic (Berliner Philharmoniker) – one of the top symphony orchestras in the world. The main Grand Hall (Großer Saal with 2,440 seats) opened in 1964, and although it was designed at the same time, the smaller Chamber Music Hall (Kammermusiksaal with 1,180 seats) was only completed two decades later. The main hall in a pentagon shape pioneered vineyard-style seating arrangements with the orchestral platform at its center. 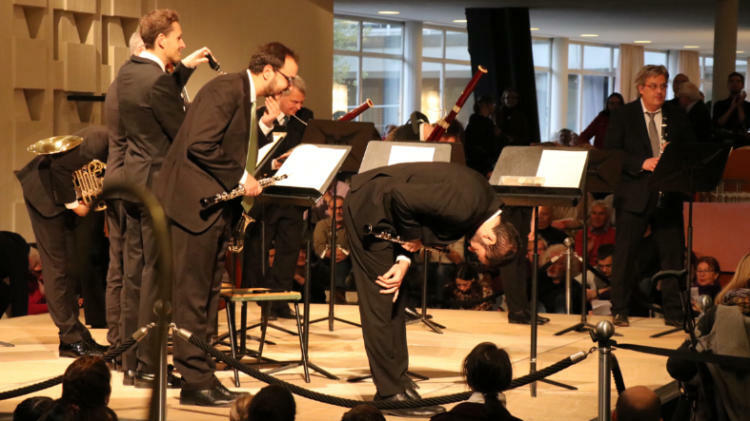 Tickets for performances in the Berliner Philharmonie are often surprisingly affordable, especially given the quality of the orchestras and performances, but no concerts are better value than the free lunchtime concerts on Tuesdays. Most Tuesdays at 13:00, music lovers may enjoy free lunchtime concerts in the main foyer of the Kammermusiksaal of the Berliner Philharmonie, which has surprisingly good acoustics. No concerts (or tours) are held during July and August or on holidays. 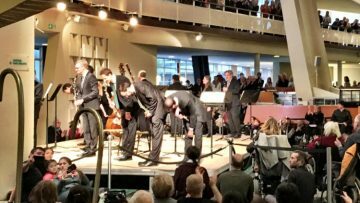 The music is mainly chamber music with the performers often members of the Berlin Philharmonic, scholars of the Karajan Academy, instrumentalists of the Deutsches Symphonie Orchester, the Staatskappelle, or similar world-class performers. 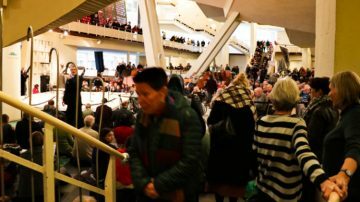 Admission to the Lunchtime concerts in the foyer of the Berlin Philharmonie is completely free and gratis – donations to Unesco are gladly accepted but there is no pressure whatsoever to contribute. It is not possible to make reservations for the lunchtime concerts or to keep spaces for late arrivals. Each visitor receives a plastic token at the entrance and hands it back two steps later – the reverse happens if leaving the concert space before the start of the performance, as only 1,500 visitors are allowed per concert. The concerts are hugely popular with many regulars turning up prepared with cushions, books, food and drink at least half an hour before the start of the concerts. Small meals and drinks are also for sale. As the concerts are very informal and held in the foyer rather than in one of the famous halls, very limited seating is available and really only intended for the infirm. Most visitors sit on the floor and stairs or stand at the back. The concerts generally last around 45 minutes. As is practice in northern Europe, clapping is done at the end of the concert only and don’t expect an encore performance. The inside of the famous concert halls may only be seen when attending a paid performance or on the daily guided tours. These hour-long guided tours in German and English start at 1:30 on most days – prior reservations are not possible but tickets (€5) may be purchased from noon on the day of the tour. The Berliner Philharmonie is at Herbert-von-Karajan-Str.1 – named after the famous conductor that took the Berliner Philharmoniker to world fame while musical director from 1955 to 1989. It is part of the Kulturforum that includes amongst others the Gemäldegalerie (National Portrait Gallery), Musikinstrumenten-Museum (Musical Instruments Museum) and the Kunstgewerbemuseum (Applied Arts Museum). It is at the rear entrance to the Sony Center and thus only a long block from Potsdamer Platz. 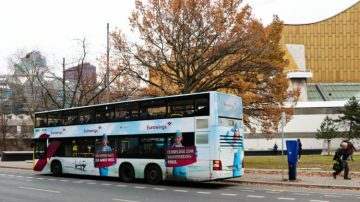 The closest bus stops are Philharmonie on the very convenient bus 200 or use buses M48 and M85 (stop Kulturforum / Varian-Fry-Straße). All the public transportation options at Potsdamer Platz are only a block away and a great option especially after a concerts when bus 200 gets very full in both directions.